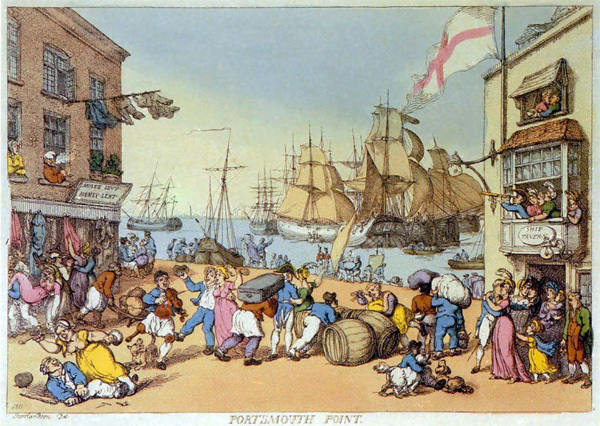 Portsmouth Point, by Thomas Rowlandson, in 1811. The Port Towns and Urban Cultures group is dedicated to furthering our understanding of the social and cultural contexts of ports across the globe from the early modern period. It recognizes the importance of ports as liminal places where marine and urban spaces converge, producing a unique site of socio-cultural exchange that reinforced and challenged identities, perceptions and boundaries. Established in 2010 by leading members of the History department at the University of Portsmouth, the group comprises a team of academics from a range of socio-cultural disciplines, an international array of contributors and collaborators and a number of PhD students. Based at the Milldam Campus in the School of Area Studies, History, Politics and Literature, the Port Towns and Urban Cultures group seeks to develop relationships with non-academic institutions, groups and audiences whilst promoting further research and expanding collaboration with national and international universities, museums and community groups.